The former Milwaukee Road Shops site is now the Menomonee Valley Industrial Center and Community Park, home to 10 industrial buildings, a nationally renowned stormwater treatment system, trails, and park. Once widely known “Wisconsin’s biggest eyesore,” the site of the former Milwaukee Road Shops just west of downtown Milwaukee is now one of the largest brownfield redevelopment successes in Wisconsin history. 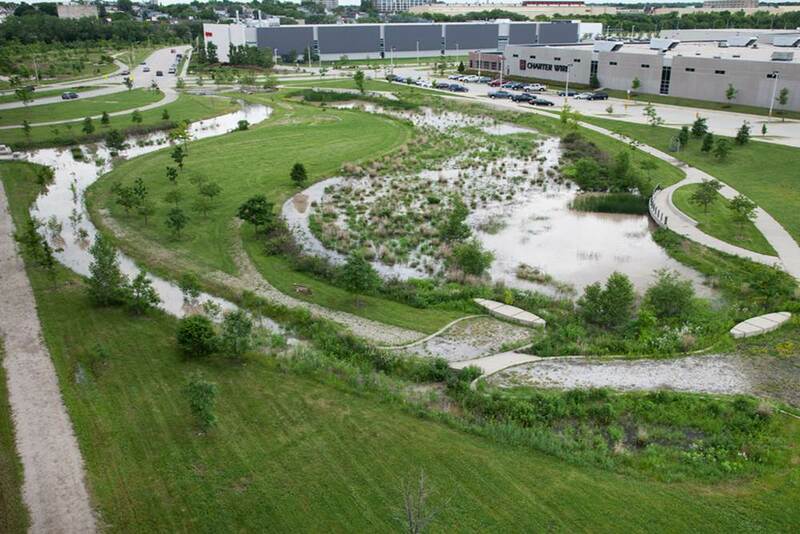 In a 2002 national design competition, Wenk Landscape Architecture & Planning produced an innovative master plan integrating recreational features, stormwater control, and sustainable designs that led to the creation of 60 acres of industrial land and 60 acres of public park. The Menomonee Valley Industrial Center (MVIC) is now home to fourteen businesses that have created more than 1,400 jobs, a renowned stormwater treatment system, trails, and park. The development successfully balances environmental, economic, and redevelopment interests. The Milwaukee Road Shops, one of Milwaukee’s largest employers during Milwaukee’s major growth in the 1800s, the Milwaukee Road manufactured and operated trains from this site across the continent. It connected Milwaukee with the Mississippi River in the early 1850s, the Great Plains by the 1880s, and over the mountains to Seattle in 1909. 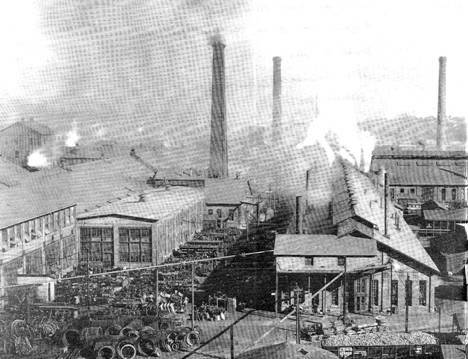 At one time, the Milwaukee Road employed thousands of people. 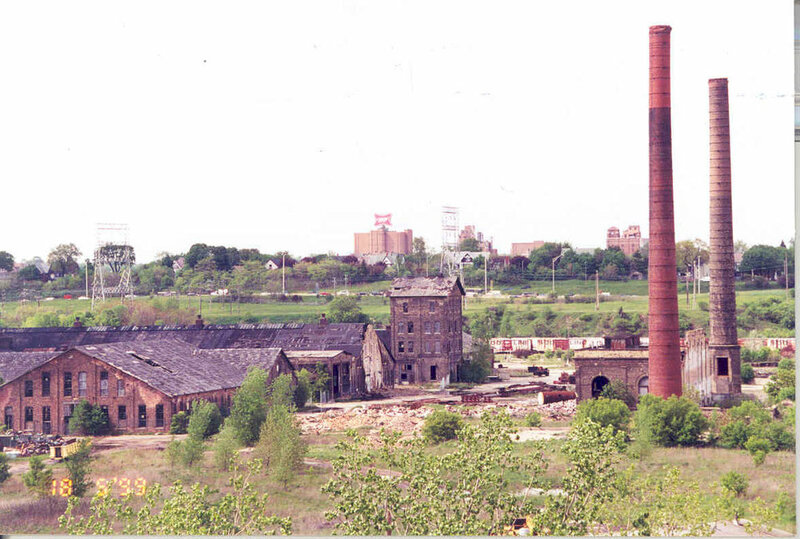 After it closed in the early 1980s, the area degenerated into a 120-acre site of abandoned buildings and railyard. The private development community ignored the site because of its poor access, lack of infrastructure, frequent flooding, unstable soil conditions, derelict buildings, and soil contamination. The rebirth required a public-private partnership. Menomonee Valley Partners (MVP) was created to fill this role with a small team of employees and diverse board consisting of Valley firms, public officials, representatives from the adjacent neighborhoods, and at-large members from further afield. MVP fostered relationships, recruited businesses, and convened stakeholders to shepherd a development that would benefit the entire community. We could have sold the whole project out in a couple of years if we weren’t picky, but it took about 10 years to find the right mix of developments that we could feel good about. We needed the help of multiple groups to do the heavy lifting—the corporate sector to invest, the non-profits to help make the connection with the neighborhoods. It’s more than the city could do on its own. After acquiring the vacant, contaminated Milwaukee Road Shops site in 2003, the City remediated environmental conditions, constructed new infrastructure, and brought the site out of the floodplain through a partnership with the DOT that utilized 900,000 cubic yards of fill from the Marquette Interchange interstate project, saving 75,000 truckloads of material from a landfill. The Department of Natural Resources completed the Hank Aaron State Trail, which winds through the heart of the site, providing recreational trails that are a great amenity to neighbors and MVIC employees alike. Some growing companies showed vision and began construction before roads even existed on the site, and today Palermo’s Pizza, Badger Railing, and Caleffi Hydronics provide more than 750 family-supporting jobs. The job density and wage guidelines developed by MVP were used by the city in land sales agreements. Sustainability is woven throughout all aspects of the project. The City adopted the Menomonee Valley Sustainable Design Guidelines, and all projects have been built using sustainable design and energy efficiency principles. A 30-acre park-like setting is actually a system of native plants that treats the stormwater runoff from 60 acres of private industrial development and 10 acres of roads, ensuring that stormwater from the MVIC is filtered before returning to the Menomonee River. The park benefited incoming businesses as well, allowing businesses to maximize their building footprints without having to acquire and preserve open space on their individual sites for stormwater to be absorbed. In the Menomonee Valley Community Park, picnic tables were built from wood salvaged from the former Milwaukee Stockyards and benches were made from excess sewer pipe that would have gone to a landfill. Walking paths along the south bank of the river are lined with cream city bricks salvaged from a nearby demolished building and throughout the park artistic panels made of recycled glass tell the story of the Valley’s flora and fauna. Hundreds of volunteers planted trees, shrubs, and grasses. Wildlife returned to the Menomonee River, and neighbors, employees, and commuters discovered the park’s amenities for hiking, biking, and picnicking. Menomonee Valley companies continue caring for the park through the Stew Crew program. It was recognized by the Sierra Club as one of the 10 Best Developments in the nation, demonstrating that the Menomonee Valley truly is a national model for sustainable development and environmental restoration. Through countless hours of volunteer time, dozens of community meetings, and the devotion of experts from a range of disciplines, the MVIC is now home to more than 1,400 family-supporting jobs, 860,000 square feet of sustainably designed industrial buildings, public access to the Menomonee River, a 2-mile segment of the Hank Aaron State Trail, a sustainable stormwater treatment system, a restored riverbank, greenspace for playing fields, two canoe launches, and 45 acres of native prairie and woodland along the Menomonee River.